The latest addition to Disney’s Signature Collection is their 1953 animated classic Peter Pan, which also happens to be celebrating it’s 65th anniversary this year. A spirited take on J.M. Barrie’s classic novel and stage play, which Walt Disney savvily acquired the rights to in 1938 with the full intention of turning it into a movie, the film remains the most iconic onscreen rendering of the story, and one of the shining jewels of Disney’s 1950s output. This is not to say that elements of it don’t feel dated. The film’s heavily stereotyped depiction of Native American characters, including the song “What Made the Red Man Red?” which is easily the most dated aspect of the film, are very much a product of its time, to put it mildly. But the fact that the story of Peter Pan, with its themes of not wanting to grow up and the importance of retaining the magic of your childhood, continues to delight new generations is a true testament to the film’s staying power. The animation is beautifully drawn, the characters are memorable – Tinkerbell’s pantomime antics remain iconic – and it’s filled with delightful moments. I have fond memories of watching it as a kid, and I’m happy to say it’s a film that I still enjoy to this day. The Blu-ray comes with several new bonus features. Stories From Walt’s Office: Walt & Flight is a short featurette that focuses on Disney’s lifelong fascination with airplanes and how this inspired the flying scenes in the film; and A Darling Conversation With Wendy & John is an interview with voice actors Kathryn Beaumont and Paul Collins reminiscing on their experience working on the film as kids. There are also new sing-along versions of the songs “You Can Fly” and “Never Smile At a Crocodile,” the latter of which only appears as an instrumental in the film but became a beloved hit when it was released as a promotional single to go along with the release. The Blu-ray also comes with a selection of archival bonus features from the 2013 Diamond Edition release, including a commentary track with Roy Disney, a handful of deleted songs and deleted scenes, and the featurettes Growing Up With Nine Old Men, You Can Fly: The Making of Peter Pan, Tinker Bell: A Fairy’s Tale, The Peter Pan That Almost Was, The Peter Pan Story, and In Walt’s Words: “Why I Made Peter Pan”, among other things. While more casual consumers who already got the Diamond Edition five years ago might not want to spring for a new version of the film so soon after, and there are only a few new bonus features to separate out this edition, this Signature Collection release comes easily recommended for fans and collectors, and especially those who never got a copy in the first place. 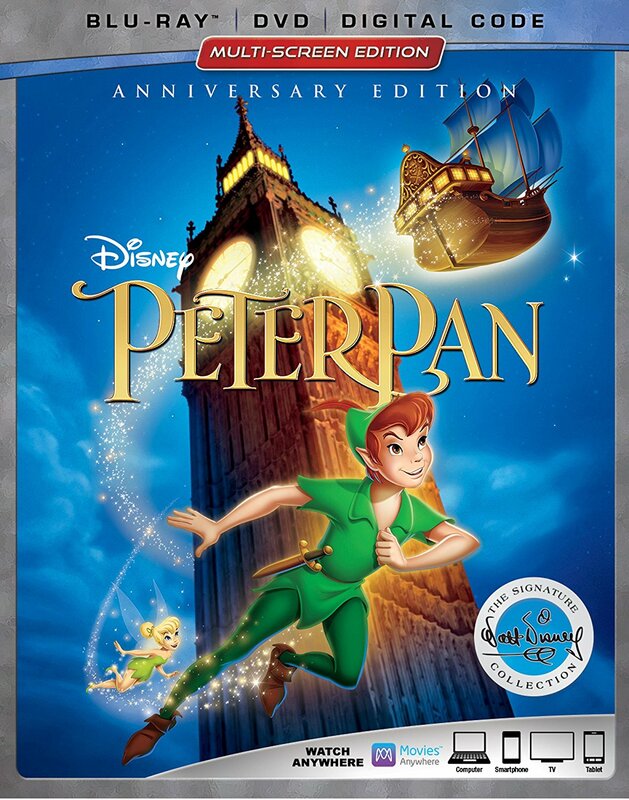 Peter Pan: The Signature Collection is a Walt Disney Studios Home Entertainment release. It’s 77 minutes and rated G.